Thorcon Shotcrete and Shoring is located in Littleton, Colorado and services Colorado, Utah, Texas, Nevada, Arizona and New Mexico with slope stabilization and design-build projects that include Micro-Piles, Shotcrete/Gunite, Rock Bolts and Ground Anchors. Thorcon Shotcrete and Shoring is a member of The American Shotcrete Association and can provide experienced ACI Certified Application Specialists and Nozzlemen to any job site. In addition, Thorcon Shotcrete and Shoring is OSHA (Occupational Safety and Health Administration) and MSHA (Mine Safety Health Administration) certified. 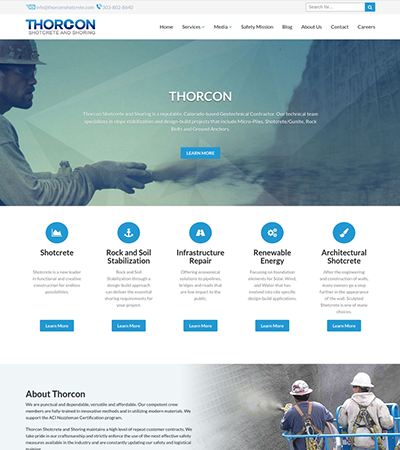 Folsom worked with Thorcon to create a clean website that communicated their branding and value to highly targeted website visitors. The website is mobile optimized, simple to navigate, and is lead generation focused. Folsom also manages Thorcon's Google Adwords display and search network marketing, utilizing location and demographic targeting to maintain a pipeline of highly relevant leads.